When you unzip the flap of your rooftop tent and see a pride of lions padding silently across your sandy campsite at sunrise, you are hooked for life. 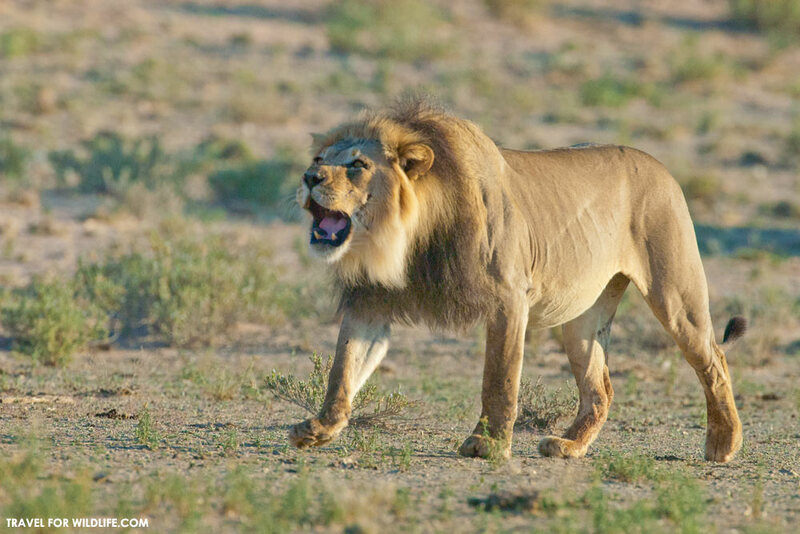 Lion roaring in the Kgalagadi Transfrontier Park. Mabuasehube is a rare kind of place. It’s a place where great African predators co-exist peacefully with human visitors, where the ecosystem feels complete and whole; a true wilderness that can be visited without destroying it in the process. It’s a place where you can still feel like a great explorer, where you face challenges and depend on your own wits, where you can travel independently without spending a fortune. It’s hard to believe a place like this still exists on Earth. But here it is, tucked into the eastern edge of the Kgalagadi Transfrontier Park in Botswana. 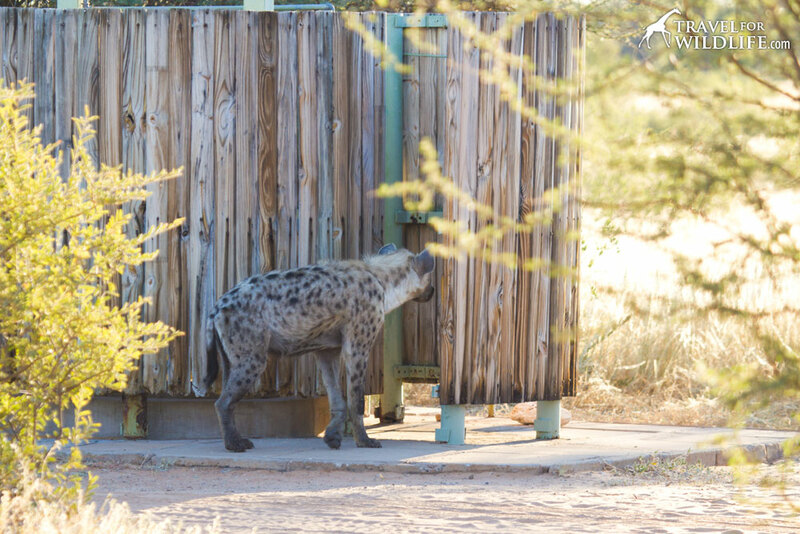 A spotted hyena visits the shower enclosure at the Monamodi Pan campsite in Mabuasehube. There are only 17 campsites in the entire 780 square miles of wilderness so it’s quite possible to go a whole day without seeing another human. Once you discover Mabuasehube and realize what a rare gem it is, you can’t help but want to keep it all to yourself. That’s why I am a little hesitant to write this guide. Do I really want more people to discover this amazing place? Do I really want to make it more difficult to book my favorite campsites? Well, no. But here I go anyway. 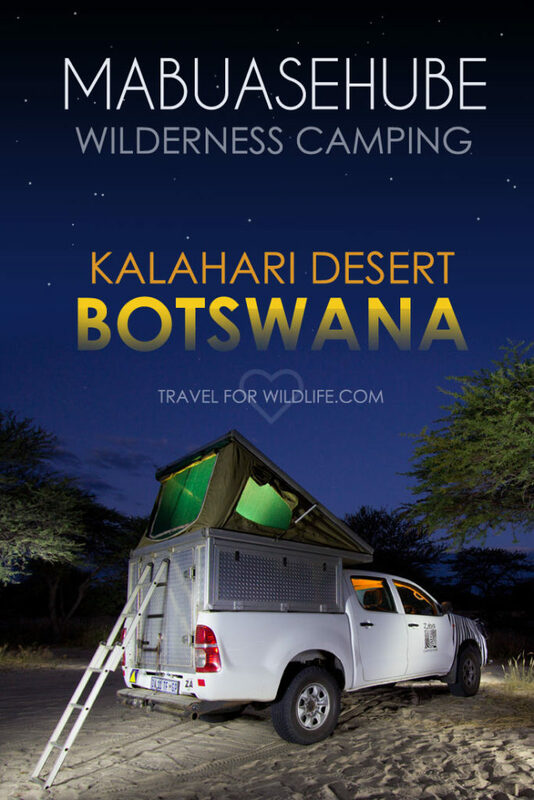 If you’re looking for Kalahari camping in Botswana, then you’ll be glad you read this Complete Guide to Camping in Mabuasehube. 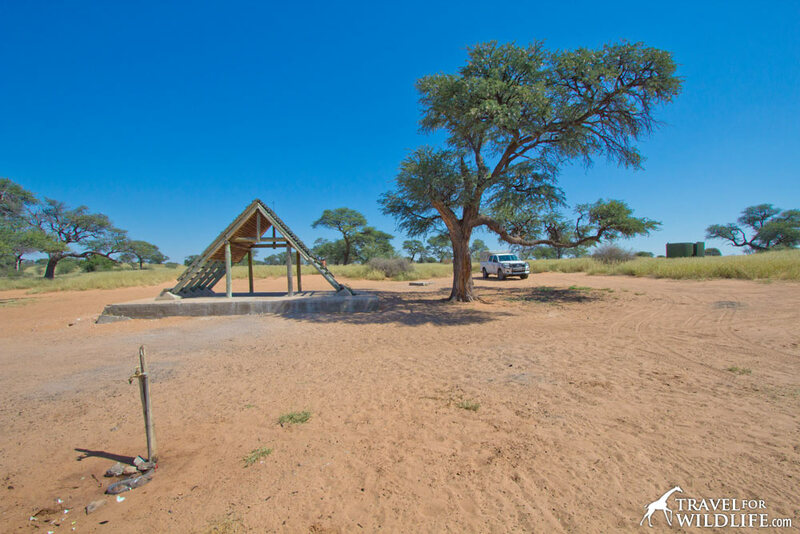 When you’re ready to choose your campsite, make sure you read our in-depth companion article a A Complete Guide to the Mabuasehube Campsites first! Camping at Bosobogolo Pan in Mabuasehube. 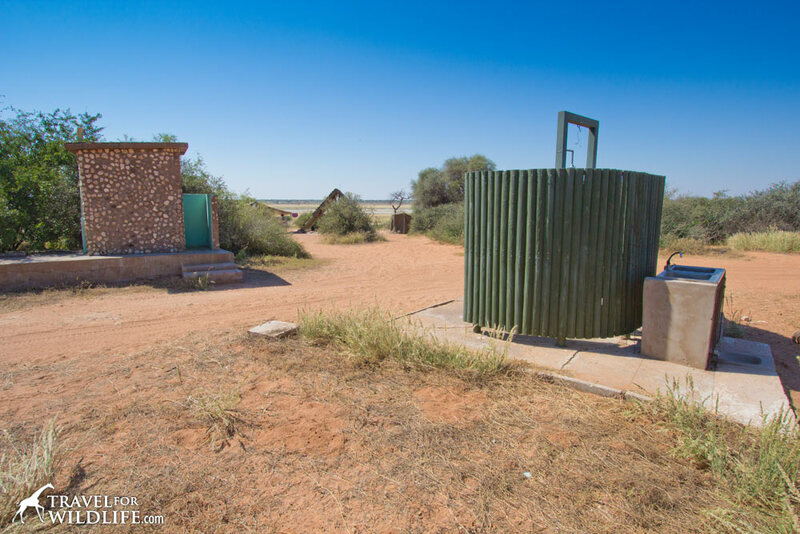 I’m not trying to scare you off, but there are a couple things you need to know before considering camping in the Kalahari wilderness in Botswana. This is an extremely remote camping experience and there are very few facilities so you have to be totally self-sufficient. You must be totally self-sufficient when camping in Mabuasehube. Inside Mabuasehube there is no cell phone coverage and no internet. There are no shops, no medical facilities, no fuel stations, and no electricity. And most importantly there is no water (with a few notable exceptions which you can find in the list of campsites.) Campsites have very few facilities: a shade shelter and sometimes a pit toilet and shower enclosure which may or may not have water. Mabuasehube campsites have an A-frame shade shelter and sometimes a pit toilet and shower enclosure. The only access is by four-wheel-drive vehicle across remote sandy roads and you must carry everything with you including all the food, water, and fuel for your entire visit, plus a few extra days of supplies in case something goes wrong. You may go an entire day without seeing another human so you must be prepared to wait if you require help. 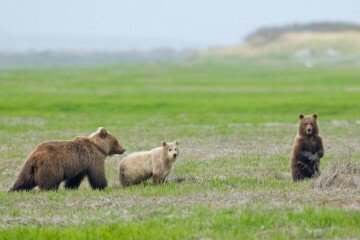 The only staff in the reserve are at the entrance gate on the east boundary. 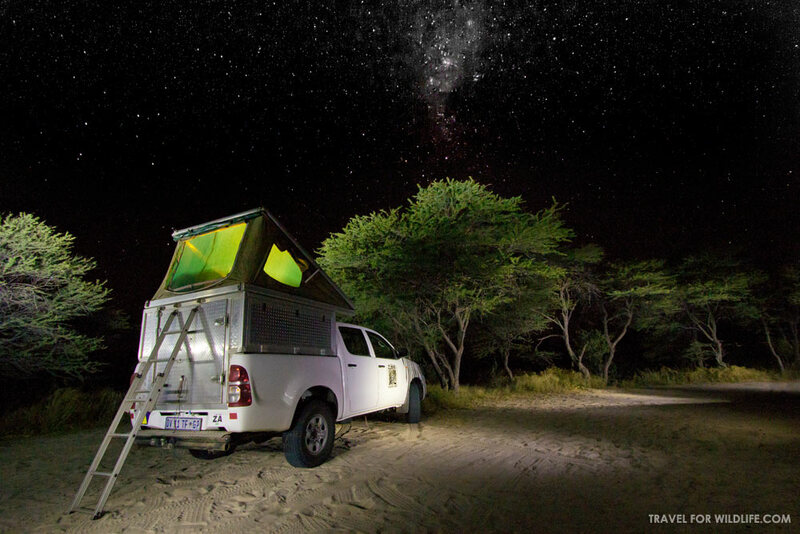 If all this sounds like a dream come true, then you’re the kind of person that is going to love Botswana camping in the Kalahari. Yep, it’s a tricky name. Mabuasehube means “red earth” and is roughly pronounced “mah-BOO-ah-say-OO-bay”. 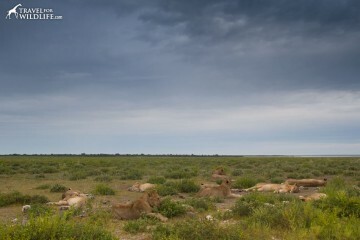 Sound out each syllable separately and you’ll do OK.
Botswana has two huge Kalahari wilderness camping areas, the Central Kalahari Game Reserve and the Kgalagadi Transfrontier Park which includes the Mabuasehube Reserve. 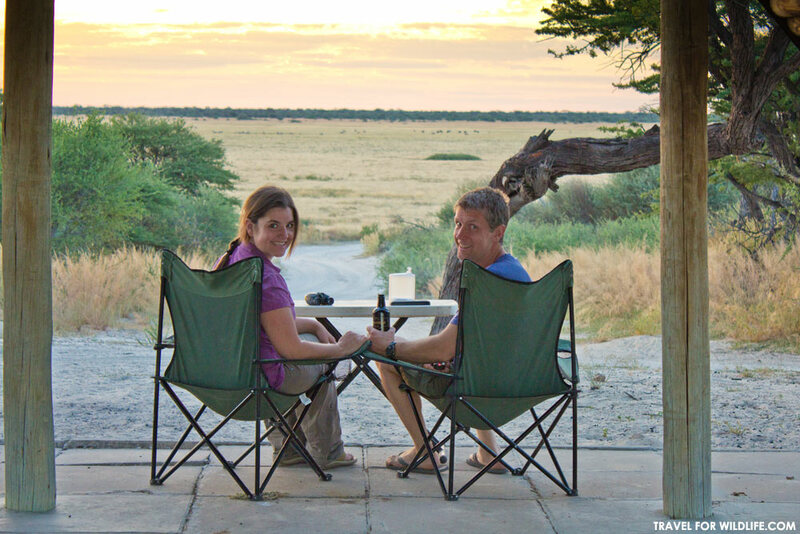 You can learn more about camping in the Central Kalahari in our article Traveling to the Central Kalahari Game Reserve. 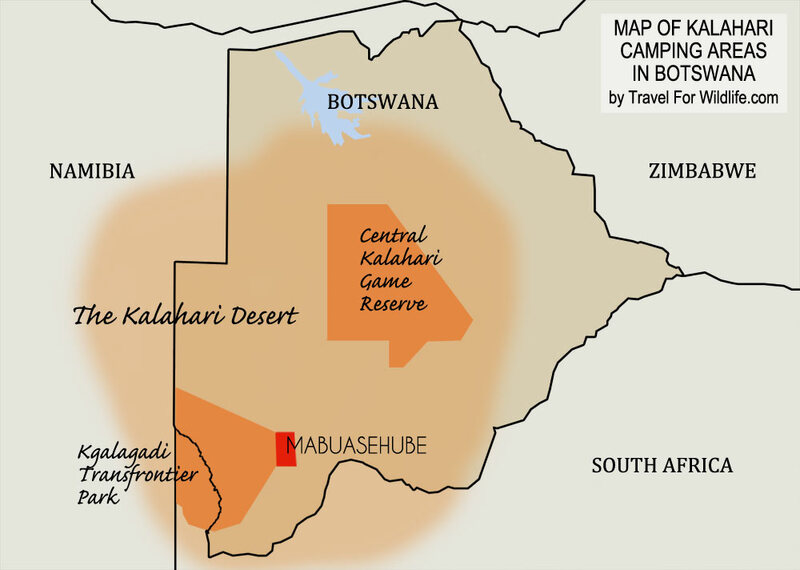 Kalahari Desert Map, showing Kalahari camping areas in Botswana. 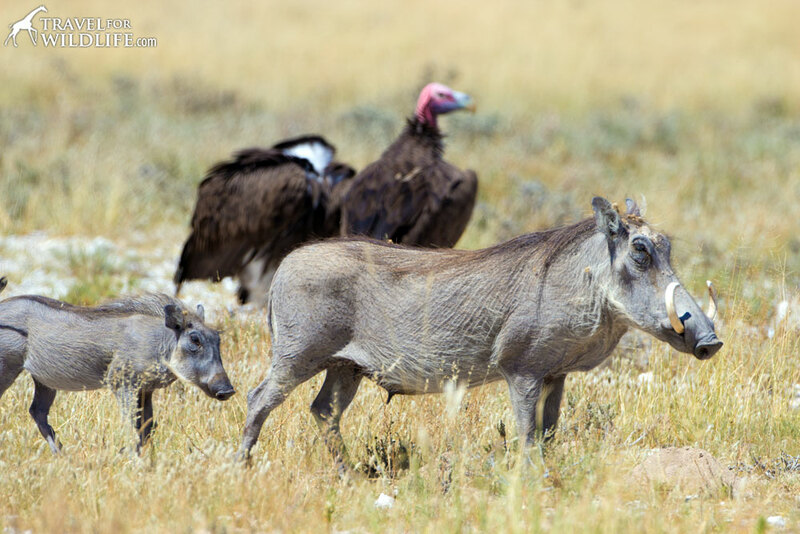 The Mabuasehube region is a rectangle 33 km wide (20 miles) and 63 km long (39 miles) that encompasses a pristine tract of Kalahari desert and was originally established as the Mabuasehube Game Reserve in 1971. The reserve was incorporated into the adjoining Botswana Gemsbok National Park in 1992. In the same year a formal agreement was reached with the adjoining Kalahari Gemsbok National Park in South Africa to begin managing the entire conservation area as a single cross-boundary unit. 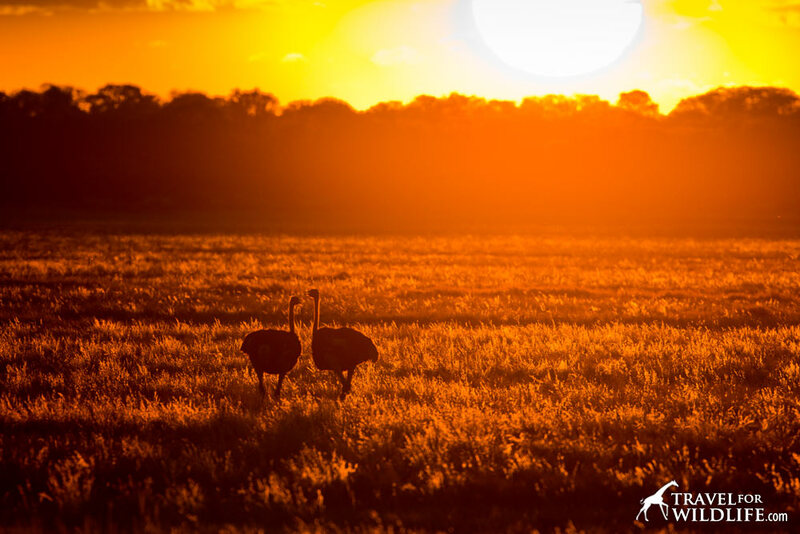 In May of 2000 the park officially opened as the Kgalagadi Transfrontier Park, and was the first peace park in Southern Africa. Getting to Mabuasehube is a bit of challenge, and that’s a good thing. It keeps the place from getting overcrowded. But this also means you have to be dedicated to get there. The only access is by four-wheel-drive vehicle through somewhat-challenging sand tracks. (See the list of access routes below.) For those of you who are already avid four-by-four drivers in the area (generally South Africans) then this probably isn’t much of a deterrent. But for the rest of us, who may have never driven a 4×4 on deep sand roads, this can seem pretty daunting. But don’t fear. If we could do it, so can you. If you don’t already own a 4×4 in Southern Africa you have a few different options. One possibility is to ship your own 4×4 there. We’ve seen plenty of Europeans go this route. You can ship your vehicle from many parts of the world but keep in mind there are a heap of potential complications you need to thoroughly research first. The easier option is to rent a 4×4 camper in South Africa which is exactly what we did. Here’s why I think your best bet is to rent a 4×4 in Johannesburg, South Africa. You can also search for 4×4 rentals in Maun (Botswana) or in Windhoek (Namibia) if you already happen to be in those neighborhoods. Each has a similar driving time to Mabuasehube but it is usually costs more for international visitors to reach those towns. There are also 4×4 rentals available in Upington, South Africa (even closer) as well as Cape Town, South Africa (much farther than all of the above). We chose Zebra Camper Hire in Johannesburg for our 4×4 hire because the prices were very reasonable. You can expect to pay about $100 US dollars a day for the average well-equipped 4×4 camper rental, and probably more with top level insurance. Zebra’s rates came out a bit less than that. Here’s a video review of our 4×4 camper so you can get a sense of what it’s like camping in one. No, you don’t have to get a camper or a rooftop tent. You can just drive a regular 4×4 pickup or SUV and bring your ground tent and camping gear. While rooftop tents provide some psychological security from intrusions by wildlife, the truth is you’re just as safe camping on the ground if you follow the same basic common sense safety rules. 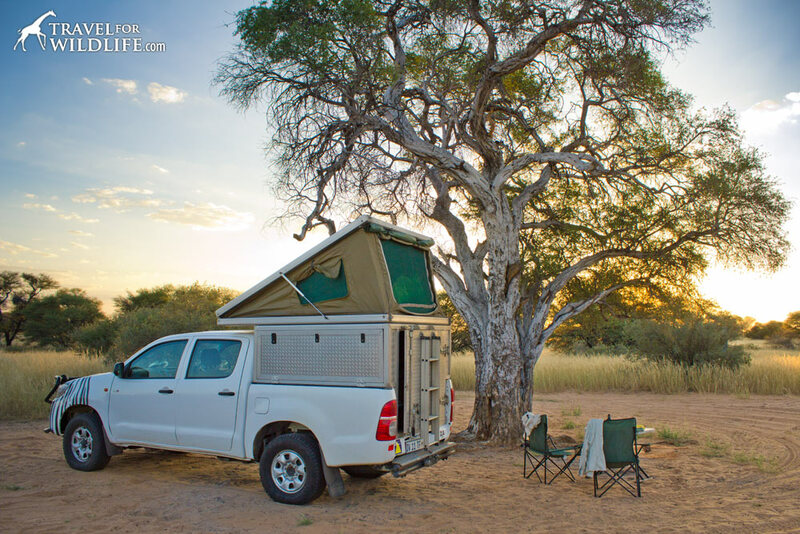 If you already have access to camping gear, you may be able to save money by simply renting a standard 4×4 pickup (commonly known as a bakkie in South Africa) from a major rental company, rather than a fully-equipped camper. That said, I have to tell you, staying in a 4×4 camper with a rooftop tent is awesome and tons of fun. The rental company provides you with all the gear you need, and often includes a built-in water tank (important in Mabua where there is little water available) as well as long-range fuel tanks (The nearest fuel is more than 100 km away along difficult deep sand roads so plan wisely!) Not to mention, many include a refrigerator powered by a separate 12-volt battery. These three features alone make it worth renting a kitted 4×4 camper in my opinion. 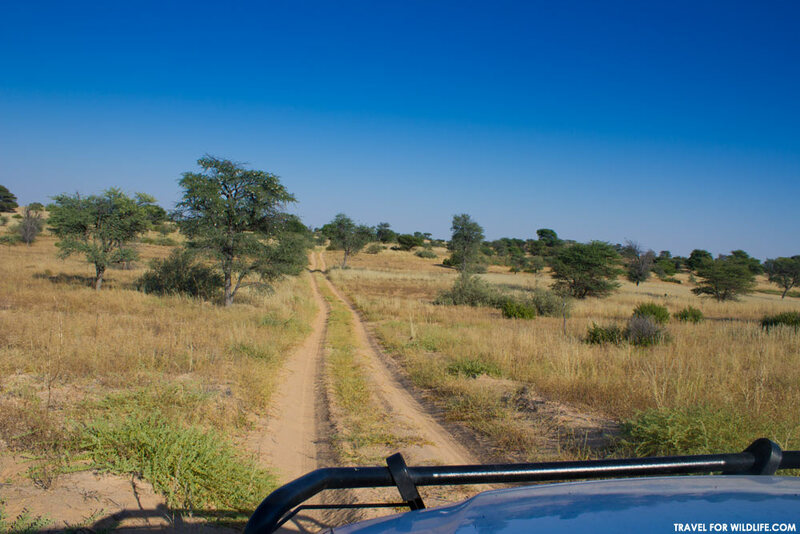 There are no easy roads into the Mabuasehube area but you do have a couple options. 1) From Johannesburg via the McCarthy’s Rest border post. We chose this route because it seemed to have the least amount of sand roads to get to the park. You stay on pavement until Tshabong in Botswana (which is also your last fuel stop before the park). From there you’ll travel about 55 kilometers of fairly easy gravelly sand roads, followed by another 55 kilometers of deep, soft sand before reaching the eastern entrance gate. When we first reached the deep sand section we immediately got stuck and spent half an hour freeing ourselves. Then we lowered our tire pressure to a more appropriate level and followed the most basic rule of sand driving: keep moving and don’t stop. After that we did fine and made it all the way to the entrance gate without further problems. All in all this was a pretty easy route and fairly simple to navigate. However, the route is a little long to complete from Johannesburg in one day because you must reach the entrance gate before closing (closing times vary depending on the time of the year, between 6 pm and 7:30 pm, see below.) I’ve read that if you don’t make it in by closing that you can camp outside the gate until it opens. We made the drive from Johannesburg in two days, stopping at a Vryburg guesthouse the first night, though camping at the Molopo Nature Reserve near the Botswana border would be another nice option. We loved our guesthouse at Vryburg, Villa Lin-Zane guesthouse. It is just outside the town (which is safer), it is quiet, their rooms are really clean, the included breakfast delicious, and it has a pool. We’ve stayed there two times and we cannot recommend it enough. You can see prices and availability for Villa Lin-Zane here (when we stayed there we paid less than $50 a night). The Bosobogolo Trail between Nossob and Bosobogolo Pan. 3) From Johannesburg via the Skilpadshek border post. This is another potential route to follow from Jo’burg and this is also the access road you’re most likely to take coming from Maun or the Gabarone area in Botswana. Coming from the Johannesburg area you would cross into Botswana at Skilpadshek border post and take the A2 heading northwest. At Sekoma you turn south onto the A20. (Sekoma is the last available fuel along this route.) There is a long cross-cut sand road that intersects the A20 south of the small town of Khakhea. We haven’t tried it personally but have read accounts from experienced visitors who say this is actually the fastest route from the Johannesburg area. 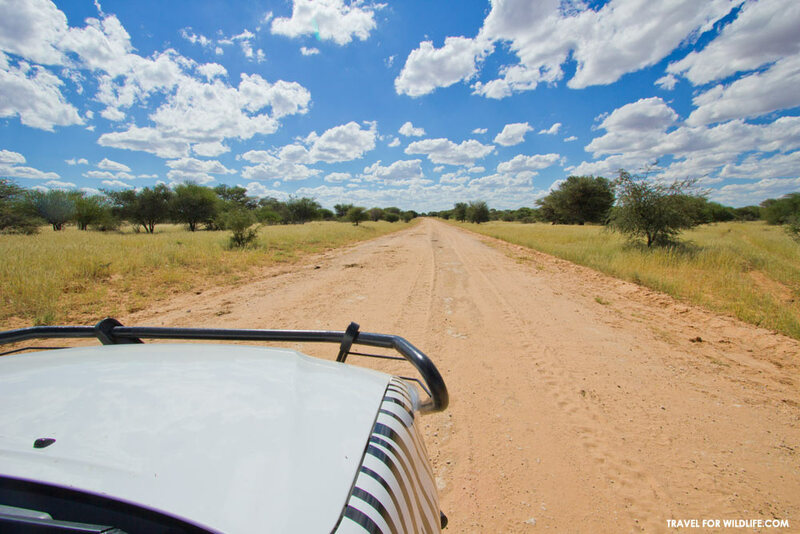 However, the cross-cut road looks a little trickier to navigate so we recommend having a good map (like the Tracks4Africa Botswana Map) and GPS. 4) There are other more obscure access routes including a 4×4 trail from the Kaa area, as well as following the northern fence line road from Hukuntsi to the north, but we haven’t tried either so we can’t comment on the ease of these routes. If you’ve tried either, please let us know in the comments at the end of the article! Do I need to take two vehicles? While the Botswana Tourism website states somewhat vaguely that “Self-drive campers must comprise at least two vehicles”, this is certainly not enforced. We entered as a single vehicle and encountered plenty of other groups in a single vehicle in the Mabuasehube area. That said, taking two vehicles is still a good safety precaution. It is possible that this rule is more strictly enforced on the permit-only 4×4 routes such as the Mabuasehube Wilderness Route, but we haven’t tried it yet so I can’t say for sure. Feel free to share your experiences in the comments section at the end of the post. If you suddenly find you need supplies, fuel, or have to patch a tire, I would head to Tshabong which is the town 110km south of the eastern Mabuasehube entrance gate. There you will find everything you might need, super market, tire shop, bank, and even an office for BWNP in case you need information. 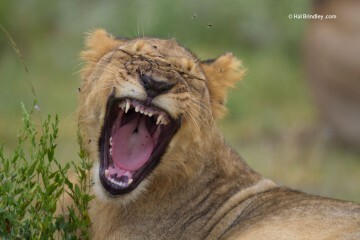 Mabuasehube is part of the Kgalagadi Transfontier Park and has the same gate hours as the rest of the park. These gate hours are not just gate hours but the time when you can leave your campsite and when you must be back at your site. So, for example, in January you cannot leave your site to go for a drive until 6am and you must be back at 7:30pm. 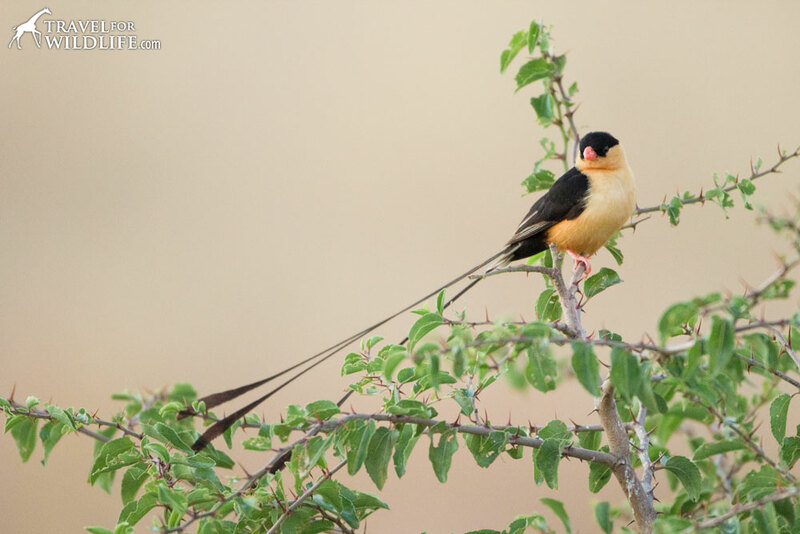 A Shaft-tailed Whydah visits the Monamodi 1 campsite. It can be a bit challenging to find a good Kgalagadi Transfrontier Park Map, but it’s seriously difficult to find a detailed Mabusehube map. The ones you buy in the park shops are good. 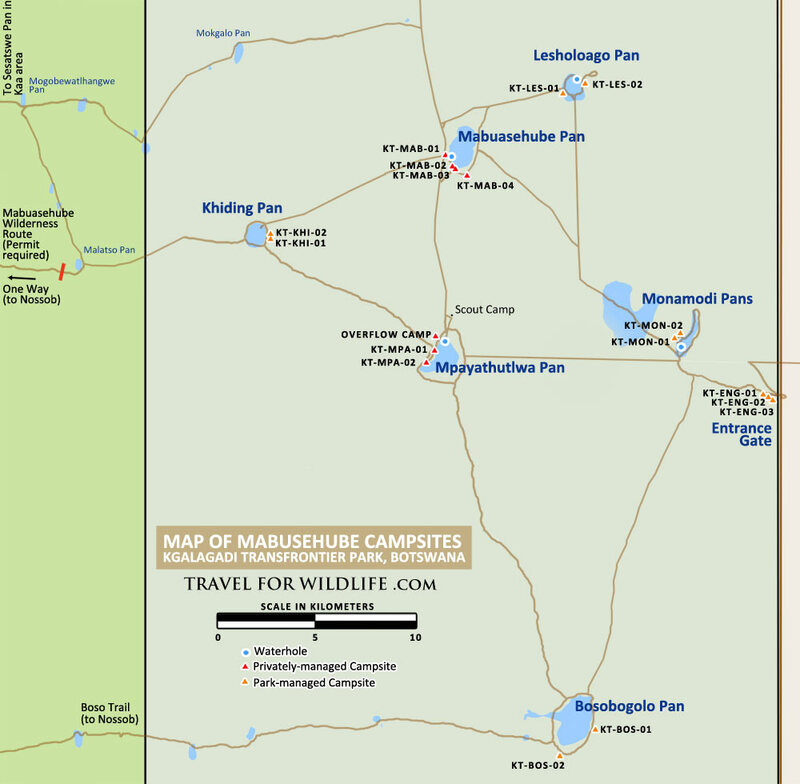 But the only really decent Mabuasehube campsites map that we’ve found so far is the blow-up on the back of the Tracks 4 Africa Botswana map. But even on this map it is difficult to figure out where the individual Mabua campsites actually are (though the online version of the map does show greater detail). That’s why I painstakingly created my own Mabuasehube Campsites Map, combining information from multiple sources and then ground-truthed it by visiting each one. These are the 2017 rates (in Botswana Pula) for camping in the Botswana side of the Kgalagadi Transfrontier Park (in Mabuasehube) plus the park entry fee rates and the daily vehicle fee. Note that the daily entry fee and vehicle fee must still be paid to DWNP even if you are staying in the private campsites. These are the published 2017-18 Mabuasehube camping rates for Inter-Tourism Group which privately manages the Mabuasehube Pan campsites and the Mpayathutlwa Pan campsites within the Mabuasehube area of the Kgalagadi Transfrontier Park in Botswana. Note that the daily park entry fee and vehicle fee (listed in the table above) must still be paid to DWNP even if you are staying in the private campsites. This is where things get tricky. Some of the camps at Mabuasehube are managed by the parks (DWNP: Botswana Department of Wildlife and National Parks) and two of the camps (Mabuasehube and Mapungubwe) have just been privatized in 2017 and are now managed by a company called Inter-Tourism Group. There was a bit of an uproar among regulars because the rates for the newly privatized sites are substantially higher now. 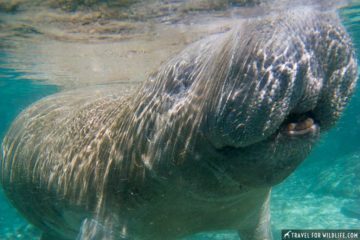 For example, the current rates for public sites is 30 Botswana Pula per person which at the time of writing equals about 3 US dollars per night per person, versus $35 per person for international visitors at the private sites. When we visited this year we chose not to stay at any of the privatized sites, mainly for cost reasons, but also because it complicates the reservation process. Making reservations at Botswana National Parks requires a bit of patience and determination. Tip: If all of this sounds too complicated, you can try using a third party booking company to handle the arrangements for you. We have heard good things from several people about Botswana Footprints who can handle all your Botswana national park camping bookings at a very reasonable price. Contact Details for Mabuasehube Campsite Reservations. Now that many campsites in Botswana’s national parks are privatized, the reservation process has become a bit complicated. It’s simplest (and cheapest) if you only stay in the park-managed sites. 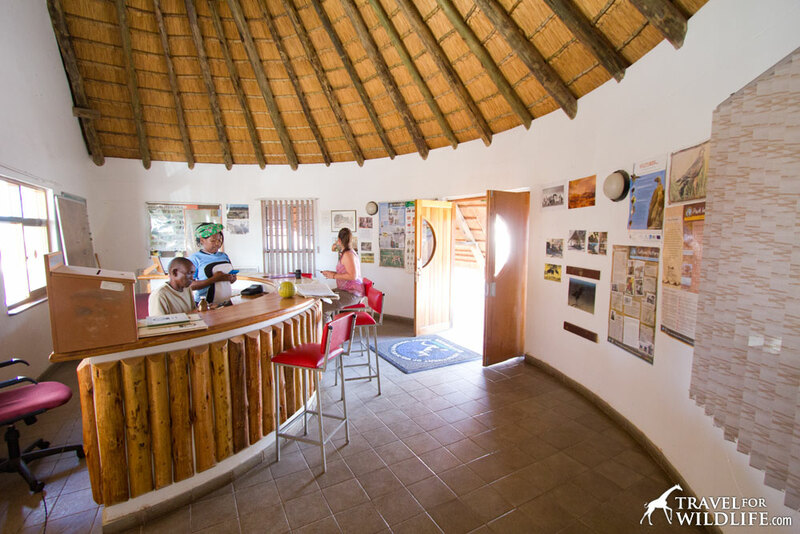 Here is a basic guide to booking campsites in Botswana parks at Mabuasehube. Make a list of the sites you’d like to stay in by looking over all the sites in our article A Complete Guide to the Campsites at Mabuasehube. Be sure to choose alternate sites for each night in case your first (or even second) choice is not available. It is possible to drive between any two sites in the Mabuasehube area within a few hours so don’t worry too much about having to jump around the park each night if necessary. Don’t expect to find much available if your dates are less than a month away. The farther ahead you can plan, the better your chances of getting the sites you want. Call the office in Gabarone +267 350-0999 to make reservations. There is no online booking system (unlike the very efficient South African side). Don’t bother with emails because they don’t tend to get answered quickly. If you’re already in the area you can visit the Gabarone office and do it in person as well. We tried calling other BDWNP offices (like Maun) and were always told to call Gabarone for Mabuasehube reservations. Once you get someone on the phone, things tend to go pretty smoothly. Write down all your reserved dates and camp sites carefully. You may not receive any sort of paper or email confirmation for your reservation. Some people receive email confirmation, some people receive paper copies in the mail (months later). We didn’t receive any of the above. We were simply given a reference number at the end of our call. You just have to trust that the (mostly hand-written) system will function. Also be sure to carefully write down the number of nights and people and the rates so you know how much you should be charged. You don’t have to make any payment over the phone. But be warned that some say you don’t have an official booking unless you have paid. In our case we paid our camping fees, entry fees, and vehicle fees at the gate on arrival and everything worked out fine, but you are probably safer to have paid in advance. Show up at the entry gate and give them all your reservation info. Here’s where you’ll be glad you wrote everything down. When we were checking in, the folks at the gate were simply reading the info out of my notebook, including the correct prices to charge us! (They got it wrong the first time and tried to overcharge us.) You can pay your camping, entry, and vehicle fees here using either Pula or Rand in cash. We haven’t personally completed this process at Mabuasehube so these instructions are based on what we’ve read (though we have completed a similar process staying at private sites in the Central Kalahari Game Reserve). As above, start by making a list of your preferred sites by reading our Complete Guide to the Mabuasehube Campsites and choose a 2nd and 3rd backup option for each night. The farther ahead you plan, the better your chances of getting your preferred sites. 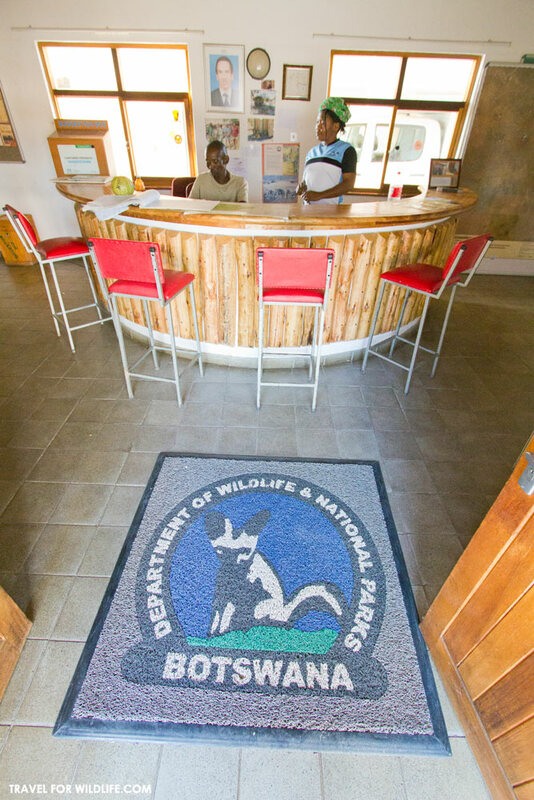 Check availability at the BDWNP (park-managed) sites first by calling the Gabarone office +267 350-0999 and reserve your park sites over the phone without making any payment. Contact the Inter-Tourism Group (details above) to check availability for your privately-managed sites. If they’re available, book and pay for them over the phone. Once you’ve received your private camping vouchers from Inter-Tourism Group, you must send the vouchers to DWNP. (Honestly I have no idea if these have to go in by mail or can be faxed or emailed.) Once proof of all camping reservations (both private and public) have been confirmed, then park entry fees (as well as camping and vehicle fees) can be paid to DWNP. 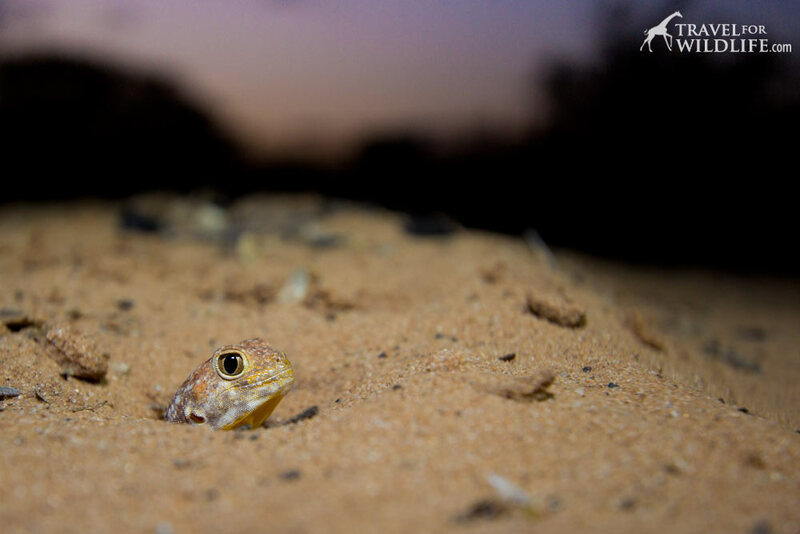 You can have great sightings any time of year in the Kgalagadi Transfrontier Park but there are a couple things to keep in mind. The rainy season is during the summer. For folks from the Northern Hemisphere remember this is the opposite time of year from your summer! This means that from about October to April you may experience occasional thunderstorms and very high temperatures. For example average highs at the peak of summer (December to February) are around 35°C/95°F though they can get much higher. Mornings can still be quite cool and pleasant. With the rains comes an explosion of plant growth. This means you’ll see beautiful wildflowers blooming, but the grass can also get quite high. This can be a little nerve-wracking when you are walking around your unfenced campsites in Mabuasehube and the waist-high grass surrounding you could be concealing just about anything! Conversely, it can get quite cold in the winter, especially at night and in the early morning. Average lows in June-August are just 2°C/35°F and can often drop below freezing. 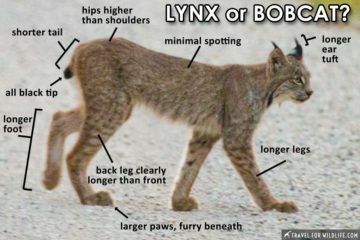 On the plus side, more animals, especially nocturnal ones, are likely to be sighted during the cooler daylight hours. Another benefit is that days are shorter, making it easier to be out for the magical sunrise and sunset light while still getting a good night’s sleep! 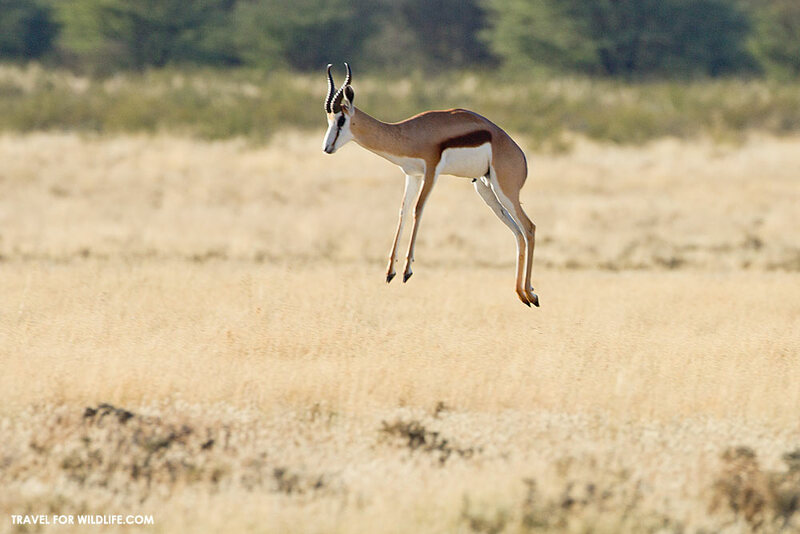 A springbok “pronking” across the Monamodi Pan in Mabuasehube. 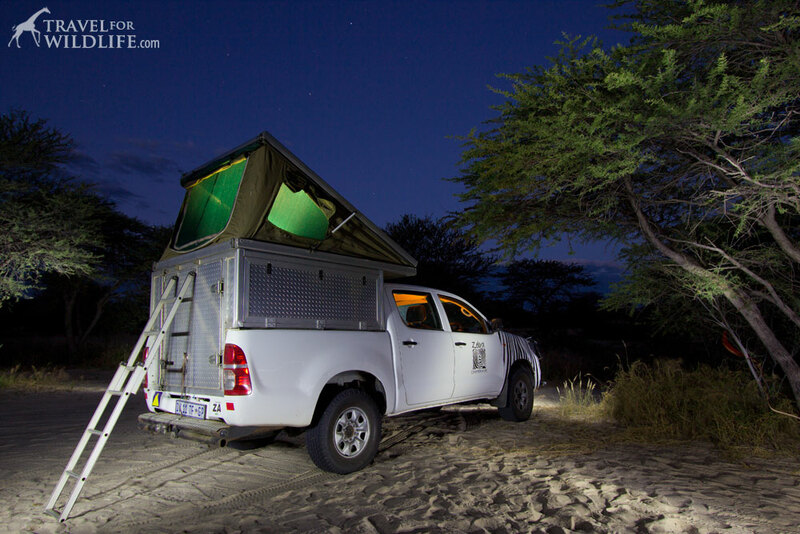 Camping at Mabuasehube is a truly rewarding challenge. 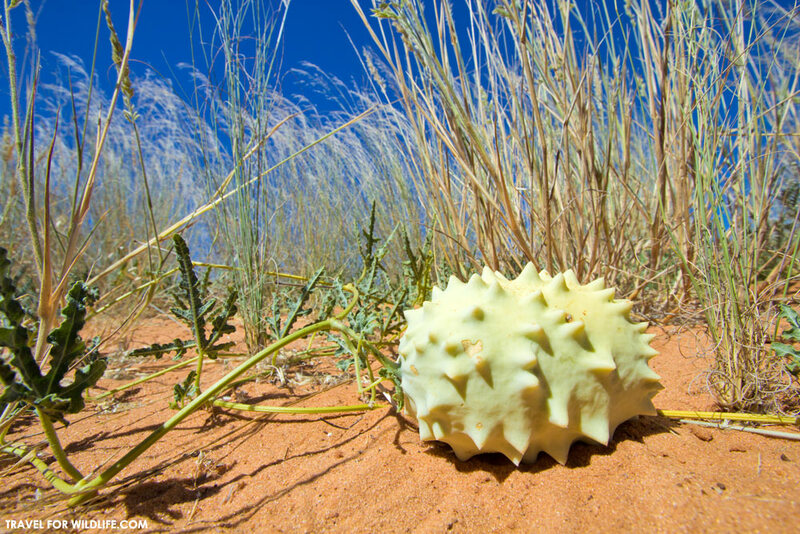 If you want to experience the Kalahari Desert and be alone in the African wilderness, there’s no finer way! Next ArticleSwimming with Stingrays, Yay or Nay? Amazing guide guys. So thorough. 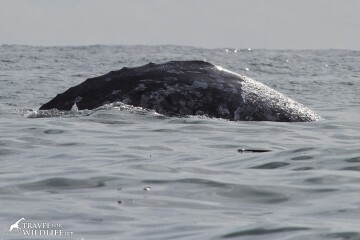 We’d love to do this trip so your info is invaluable. I’m going to get stuck into all of your posts which I’ve missed in the last few weeks, can’t wait. Thanks guys! We might see you out there soon! This will help me to plan the trip I always dreamt about. Fantastic! Hope you make it there! Thanks for the great post! I just have a question regarding the McCarthy’s Rest border post – are you allowed to take meat and fruit through from the South Africa side? I think that the rules change all the time. Last I heard you were allowed to take vacuum packaged meat, but I can’t confirm 100%. Maybe you could call them? We have been there a couple of times , but everytime I realize there is not much detailed info available . Did you both travelled with one car? Hi Jan, yes we travelled in one vehicle, but it was the dry season so we weren’t as worried about getting stuck!